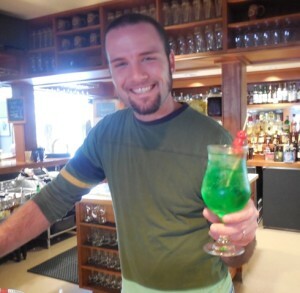 Celebrate the freshness of green with these St. Patrick's Day recipes from DINE inns. As we approach St. Patrick’s Day in New England, we can’t help but think of all those green-themed recipes being whipped up in the kitchens at the Distinctive Inns of New England (DINE). While our first choice for you on St. Patrick’s Day weekend would be to be enjoying a romantic getaway in DINE country, we know that for some this is not possible. Thus, we bring you a taste of green from DINE inns just in time for you to serve them up on St Patrick’s Day! While they may appear in the end in different shades of green and other colors, all of these recipes were inspired by green ingredients. In a small saucepan, combine cornstarch and cold water until smooth. Stir in the orange juice, vinegar, mustard and honey. Bring to a boil; cook and stir for 1 minute or until thickened. Stir in poppy seeds and salt. Cover and refrigerate until chilled. Yield: 1-1/2 cups. Step 2: Trim greens and long roots from beets. Spritz with Evo and wrap in 2 to 3 aluminum-foil packets, dividing beets according to size. Place in oven, and roast until tender, 35 to 45 minutes, depending on size of beets. Wipe the skins from the beets. Cut into slices and squares, and transfer to a serving bowl. Step 3: Drizzle vinaigrette over beets; toss to coat. 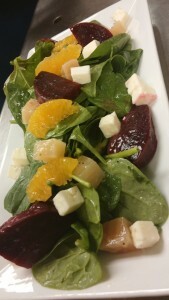 When ready to serve, lay on chilled baby spinach leaves, add feta, pecans, orange supremes. Garnish with nasturtium flower, if still out in the herb garden. 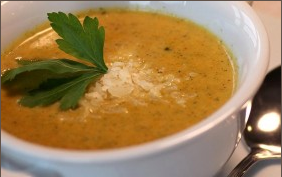 Plan on sharing this delicious soup recipe with all your friends. This gluten free soup recipe yields one gallon. Boil broccoli until tender; then shock in ice water for greener color. Set aside. In a stock pot, sweat onions, carrots, and celery until soft. Add garlic and cook for 3 more minutes. Add water, bring to a boil, and then reduce to simmer for 10-15 minutes. Add broccoli, curry, brown sugar, and salt & pepper. Puree; then return to stock pot and add heavy cream. Stir in puree and allow cream to warm. Serve when desired temperature is reached. Line a baking sheet with parchment and grease a 2-quart casserole dish or 9” x13” pan. Toss the bread in a bowl with the melted butter and spread evenly on the baking sheet. Heat the bread in the oven for 10 minutes; it won’t color but will dry out a bit. Cook the asparagus very briefly (a couple minutes) in the microwave should be sufficient. You want them to be crisp, but not hard. Toss the asparagus, onion, ham, and 11/2 cups of cheese with the toasted bread cubes. Mix together the eggs, 1 1/2 cup of the half & half and salt, and pour over the bread mixture, pressing the bread gently into the liquid. Add more half & half if it doesn’t come to within 3/4” of the top of the bread cubes. Cover the pan, and refrigerate overnight, or for at least 6 hours. Sprinkle the top of the strata with the remaining cheese. Bake the strata uncovered, in a preheated 350 oven, for about 45 minutes, or until it’s puffed and golden. A knife blade inserted into the center will come out clean. Remove the strata from the oven and allow it to rest for 15 Minutes before serving. You can make your own pesto or use a prepared one (this is one of our favorite convenience foods) . 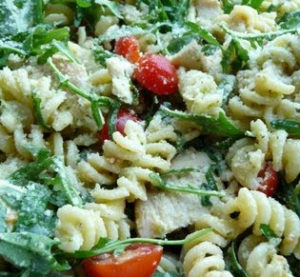 Cut the tomatoes into quarters and the arugula in small pieces. Heat two tablespoons of olive oil in a pan and add the tomatoes. Cook for three minutes until they fall apart. In the meantime, take a bowl and add the pesto, mozzarella balls, the arugula previously cut and the other two tablespoons of oil. Boil the pasta and when it’s ready add the warm tomato sauce and the other ingredients. 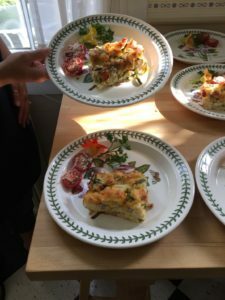 This entry was posted in advice, breakfast, Camden Maine Stay, Captain Jefferds Inn, culinary travel, Deerfield Inn, Dining, Harbor Light Inn, Rabbit Hill Inn, Recipe and tagged Camden Maine Stay recipe, Captain Jefferds recipe, Deerfield Inn recipe, New England Inn recipes, Rabbit Hill Inn recipe, Saint Patricks Day, St Paddy's Day, St Paddy's Day recipes from New England Inns, St Paddys Day recipes, St Patrick's Day, St Pattys Day by DINE Blogger. Bookmark the permalink.